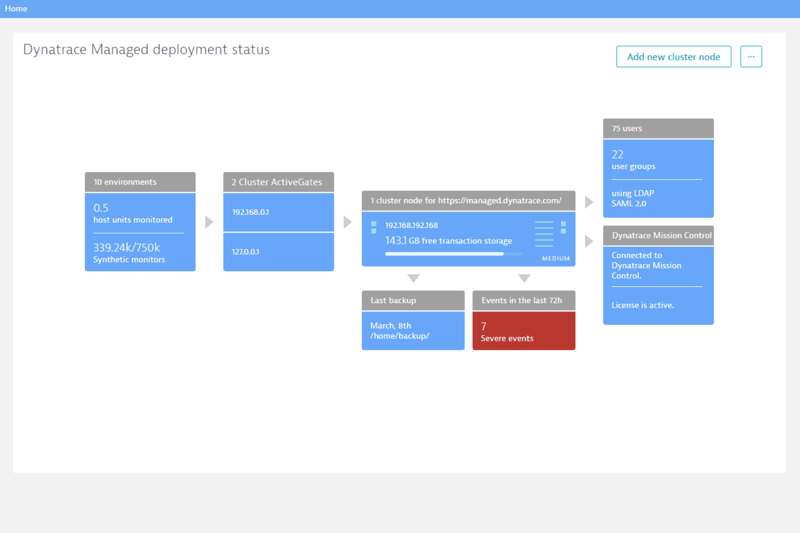 You can easily create and manage your monitoring environments using the Cluster Management Console. Select Environments from the CMC menu. Click the + Add another environment button. In the Environment name text box, type in a name for your environment. You can optionally disable synthetic monitors by setting the Enable synthetic monitors switch to the off position. After creating an environment and clicking Save, you are directed to the environment’s configuration page. You can however access an environment&apos;s configuration page at any time, by selecting Environments from the navigation menu and clicking the environment you want to configure. On the configuration page, you can set the total as well as the monthly and annual quotas for your environment. Host units - The size of a host for licensing purposes (based on the amount of RAM provided by a host). For full-stack monitoring, a host with 16 GB of RAM (or any portion thereof) equates to 1 host unit. For cloud-infrastructure monitoring, a host with 16 GB of RAM (or any portion thereof) equates to 0.3 of a host unit. For full details, see How to calculate monitoring consumption. Custom metrics - Number of unique timeseries metrics in a 28-day sliding window, evaluated each hour 28 days back. For full details, see How to calculate monitoring consumption. User sessions - Number of user sessions (i.e., "RUM sessions") to be monitored per month/year. For details, see How to calculate monitoring consumption. Synthetic monitors - Number of synthetic monitors to be performed per month/year. For details, see How to calculate monitoring consumption. Avg. daily log volume - Volume of Log analytics traffic per month/year. For details, see How to calculate monitoring consumption. Transaction storage - Volume of disk space to be reserved for transactions (for example, service calls, call stacks, and SQL statements). Symbol files from mobile apps - Amount of storage that can be consumed by the symbol files from mobile apps. Service request level retention - Amount of time the disk space for a service request is to be retained. Service code level retention - Amount of time the disk space for code-level visibility is to be retained. Real user monitoring retention - Amount of time the disk space for user sessions is to be retained. Synthetic monitoring retention - Amount of time the disk space for synthetic monitors is to be retained. Session Replay retention - Amount of time the disk space for Session Replay data is to be retained. Log Analytics storage - Volume of disk space to be reserved for Log Analytics. Log Analytics storage retention - Amount of time the specified disk space for Log Analytics is to be retained. Once any one of these limits is consumed, the respective monitoring will no longer be available and you&apos;ll need to purchase more monitoring. 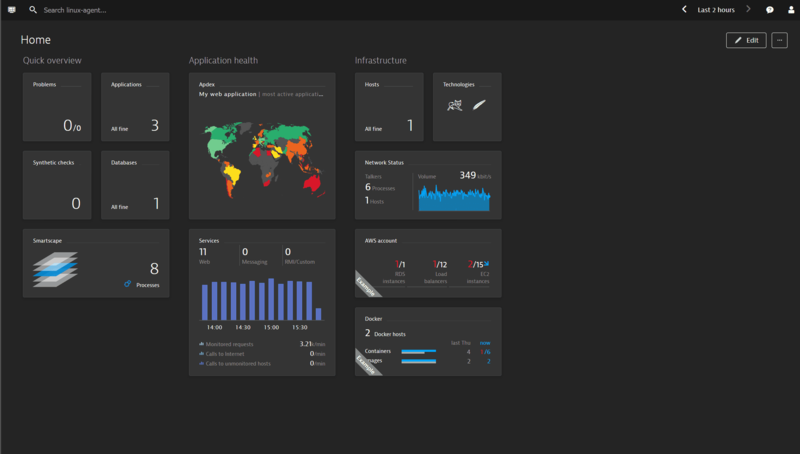 To purchase Dynatrace monitoring, contact Dynatrace Sales. Your sales representative will provide you with further details. Use these controls to assign environment permissions to defined user groups. 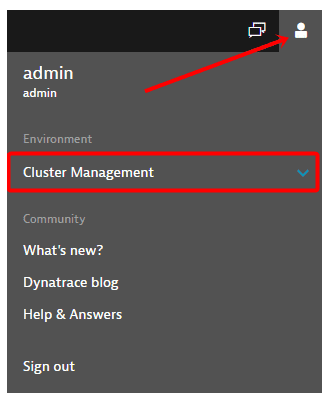 For details, see Manage user groups and permissions. Select Environments from the navigation menu. Select the environment you want to rename. Click the small pencil icon next to the environment&apos;s name. Type in the new name and click the tick mark button. Select the environment you want to disable/delete. Click the Browse (...) button in the upper right corner. Select Disable environment or Permanently delete environment. Select the environment you want to access. Click the Go to environment button in the upper right corner. Open the User menu by clicking the User icon in the upper-right corner. Open the Cluster Management drop list. The monitoring data related to each environment are displayed on your home dashboard. From dashboard view, open the User menu by clicking the User icon in the upper-right corner. Click the environment’s name to open the drop list. Select another environment you want to access.